One of the Fortnite Week 8 Challenges tasks you with getting your boogie on with a fish. Let’s do this! The clue is in the title – you need to head to named locations, so you won’t find the fish trophies in random buildings on the map. Also, some locations have more than one fish, but they will only count once towards the challenge – it’s the named location that counts, not the number of fish. You need to do this 7 times for it to count, and as always, you can’t just quit out of the game once you’ve danced. You’ll need to finish the match as normal. Here’s a map our cartographer has drawn up, with details of each location below. Dusty Divot: In the big warehouse here, go inside the office and you’ll see a dancing fish on the wall. Retail Row: In the north east corner of Retail Row is a shop with two fish trophies. There’s also a big one outside above the shop entrance. Greasy Grove: There’s a shop in the center of Greasy Grove where you’ll find the dancing fish. Salty Springs: Go to the basement of a house in the west of Salty Springs and you’ll find a dancing fish above the sofa. Shifty Shafts: There’s a small hut in the east of Shifty where you’ll find a dancing fish. Wailing Woods: In the underground bunker below wailing woods, dead center, you’ll find 3 fish together that you can dance in front of. 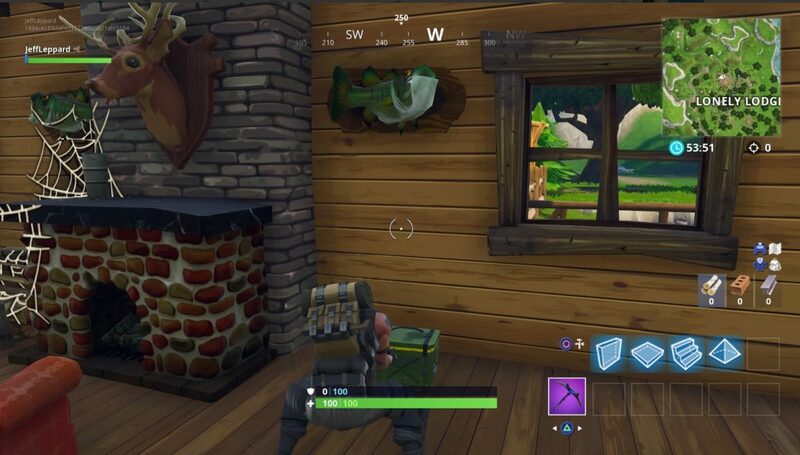 Lonely Lodge: Again, there’s two dancing fish here either side of the fireplace in the big lodge itself. You can’t miss it. Tilted Towers: this fish isn’t on the wall, but on the floor of the collapsed building in the southwest of Tilted Towers. Now you’ve boogied with the fishes, you can double check the rest of the Week 8 Challenges, including where to shoot a clay pigeon at different targets.